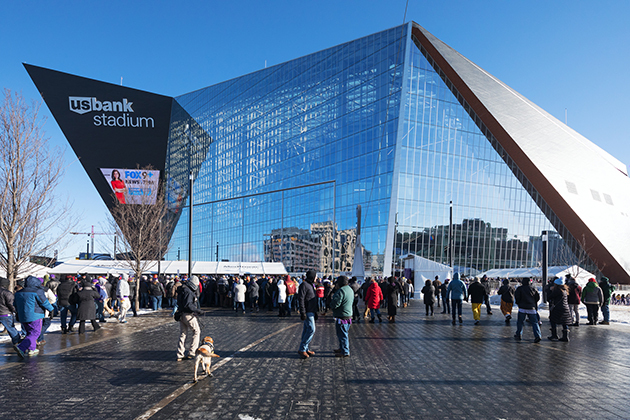 Whether you are a football fan or not, you probably know that Super Bowl LII is scheduled to happen Feb. 4 at the new U.S. Bank Stadium in Minneapolis between the Philadelphia Eagles and the New England Patriots. Beyond excitement for the game itself, there's a lot of buzz about the stadium itself, which can seat up to 70,000 fans. While some say they only watch the Super Bowl for its commercials, what's special about this year's event is that the 1.8 million-square-foot stadium is an advertisement for energy efficiency and green technologies. This structure is LEED (Leadership in Energy and Environmental Design) Gold-certified, which means that it employs energy-efficient technologies to offset 100 percent of its electricity with $733,000 worth of energy credits. The HKS architecture firm, which has also designed Dallas' American Airlines Center, Indianapolis' Lucas Oil Stadium and Milwaukee's Miller Park, struggled to create an energy-efficient stadium for such a cold Northern climate. 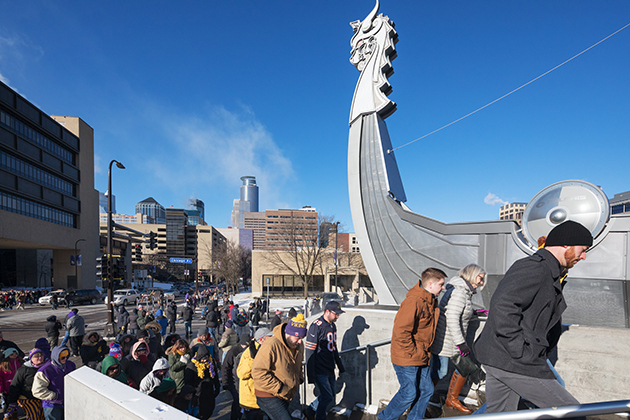 But it was exactly this climate that influenced the stadium's aesthetic design as ice formations, Viking longboats and traditional Nordic dwellings are the fitting inspirations for the home of the Minnesota Vikings. There are many aspects that work together to make the stadium so energy-efficient. The roof has a steep line that allows snow to shed easily, and southern exposure is maximized for rapid snow melting. The snow sheds off the roof "into a giant snow gutter near the roofline that features a heating system to direct the melted snow through the stadium's storm water control system." This design reduces the stadium's carbon footprint by eliminating the need for 2,000 tons of structural steel. More than half the roof is made of ETFE — described as "a clear, plastic-like, Space Age material." 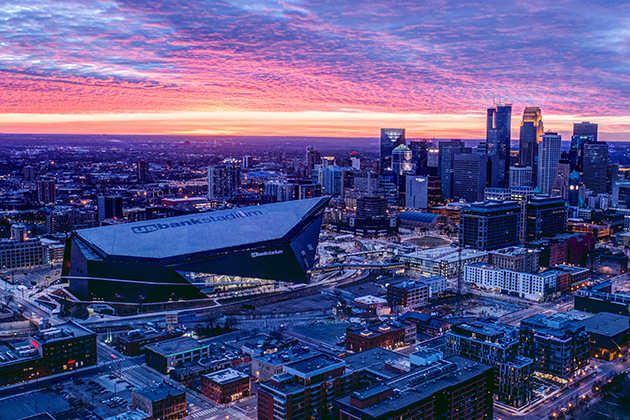 U.S. Bank Stadium is the first in the U.S. to use the material at this scale, and it includes multiple green benefits, such as optimizing natural daylight and solar thermal heating. It also aesthetically produces an outdoors effect inside. This is the first stadium in the country to fully use LED sports lighting, which cuts electric costs by 37 percent. The lighting system was paid for by the Vikings team; it was more expensive to install, but promises a shorter payback time in the long run. Motion sensors allow lights to turn off when not used. Heat recovery and and air-handling units also reduce energy costs by 15 percent. Wall and roof insulation and low-flow toilet and shower systems also add to the stadium's overall sustainability. This low-flow plumbing technology reduces water usage by 5.67 million gallons annually. An efficient landscape irrigation system also uses less water for the native plants that surround the building. The building's greatest attraction may be its west-wing doors. The lead designer of the stadium highlights "five mammoth pivoting glass doors" as his favorite feature. The doors are unique and create an integrated environment where the indoors and outdoors connect seamlessly. Finally, the stadium features a recycling program and a green cleaning program. What more could we want? It is clear that U.S. Bank Stadium has left no stone unturned when it comes to sustainable design. No doubt it sets a new (LEED) gold standard for structures of this size, and it will change the perception of sustainable energy and green technologies moving forward. And we thought people planned to watch Super Bowl LII to see who would win!